It’s a question that can only prompt an individual answer: everyone watches movies for slightly different reasons, just as we enjoy all things in life for a variety of reasons. There is no real one ‘true’ answer to the question, nor should there be. So the only question this reviewer can truly address is therefore: why do I watch movies? Looking at my favorite films – 2001 Space Odyssey, Seven Samurai, Lawrence of Arabia, Empire Strikes Back, Princess Mononoke, Baraka, The Hudsucker Proxy – the one thing that they have in common seems to be that they are both visual and audio spectacles: that they are immersive. These are movies that take me out of my day-to-day thoughts and concerns and put me into another place; they don’t just play in the background, they demand to be soaked up and enjoyed. And each presents a clear and rich vision: the aesthetic of the filmmaker(s) shows throughout. For 90+ minutes, we see, hear and feel their world and not our own. 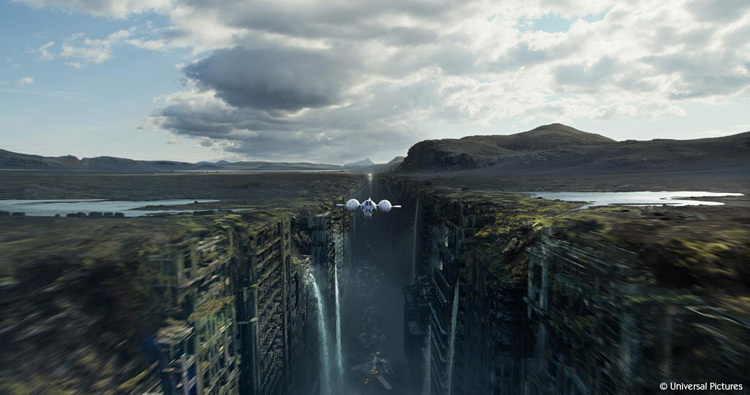 From this perspective – which ultimately can only be my personal perspective – Oblivion is a great film. It is very much a product of architect-turned-movie-director Joseph Kosinski’s personal vision, from opening shot to credits sequence. No one else could had made this film, and no one else would; love it or hate it, what we see on screen is a creator’s personal vision come to life. And after multiple viewings, that vision still amazes me. 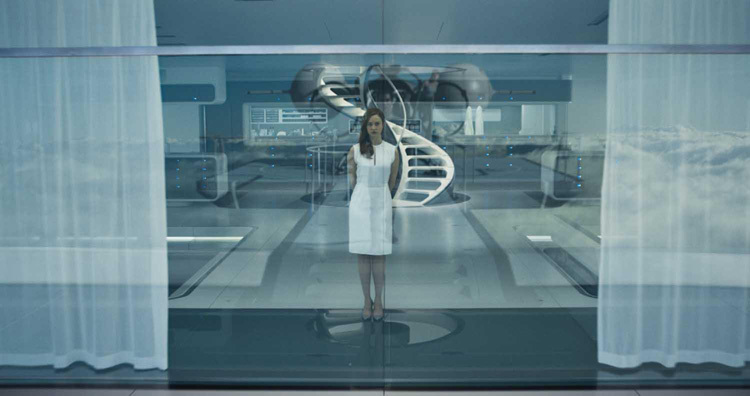 Inspired and informed by the sci-fi movies of 1970s, Oblivion uses a tiny cast of characters to tell and grand story, both epic in scope yet intensely personal. 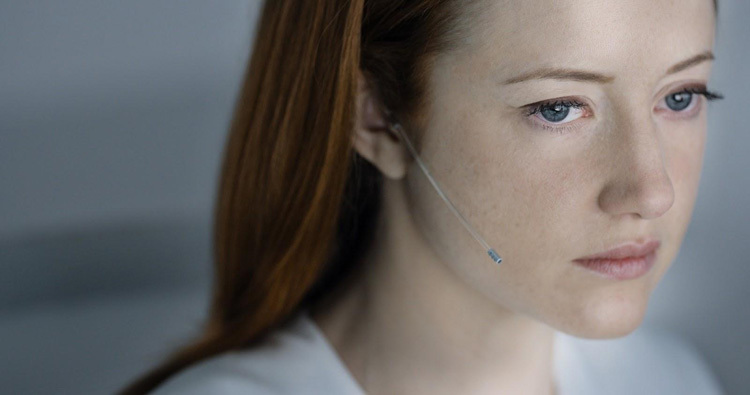 We start with a cast of three characters: maintenance tech Jack Harper(Tom Cruise), communications officer – and Jack’s lover- Vika (Andrea Riseborough), and mission control supervisor ‘Sally’ (Melissa Leo), the latter appearing simply as a face and voice on Vika’s com-screen until the final act. The cast eventually balloons to a grand total of seven named characters (six really, if you count the number of characters with significant dialogue), but the real story is about just three of them: Jack, Sally, and the mysterious woman in his dreams (Olga Kurylenko). It’s Tom Cruise’s character of Jack Harper that really moves the story forward. It’s his misgivings about his mission – to convert Earth’s ocean to hydrogen to power the human habitat on Saturn’s moon of Titan, before leaving the devastated planet to the invading ‘Scavs’ – that leads him, and the audience along with him, to learn the truth of both his mission and the real reason for his presence on Earth. wing is discovering this for yourself. It’s enough to say that Jack’s doubts are proved warranted by the events of the second act as the various anomalies shown in the first act are gradually explained. The last ‘characters’ in the film are the drones: Scav-hunting floating kill-bots created by mission control (‘The Tet’). It’s Jack’s job to repair and maintain them as they protect the floating stations that convert Earth’s oceans into useable hydrogen power. And they are nasty, scary gits: armed with disintegrating energy-weapons and programmed with a very bad attitude, and featuring a single HAL-esque blowing eyeball: uncaring and impersonal and its gaze. Like R2-D2, they communicate only in low-pitched beeps and buzzes; all of them rather ominous to our human ears. 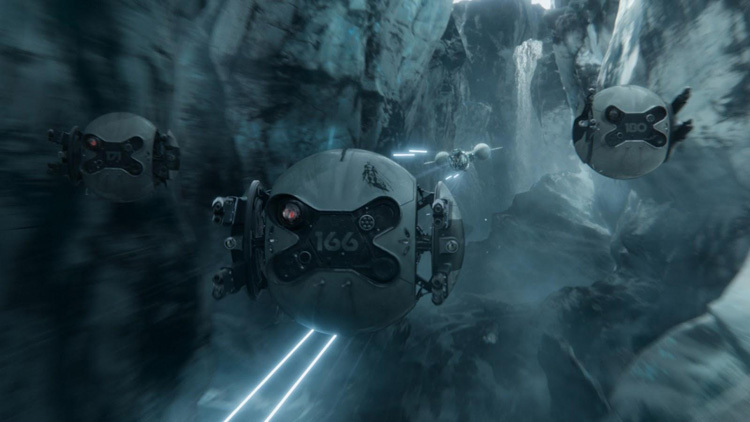 The drones share the same aesthetic as the other Tet-created tech, like Jack’s ultra-cool Bubble Ship and bike. With such a tiny cast, each individual performance must be solid to really sell each character, and under Kosinski’s direction the cast really delivers; largely since each role is directly suited for the actor. In the main role, Tom Cruise needs to communicate intensity and believability – and he does, since this is what Tom Cruise does in movies. With his rich and soothing baritone voice, Morgan Freeman (Malcolm Beech) easily sells the trust that we the audience, and Cruise’s character Jack needs to have in him and his plan. The movie is the first time I’ve seen Andrea Riseborough (Vika) in any role, and seeing her here I am sorry to say that this is the case. First off, she is gorgeous: all big blue eyes, red hair and womanly curves, in — and sometimes out of — her sixties-style form-fitting dresses. She needs to portray a woman deeply in love with a man she doesn’t quite understand, and she sells the frustration and tragedy of this incredibly well on-screen. 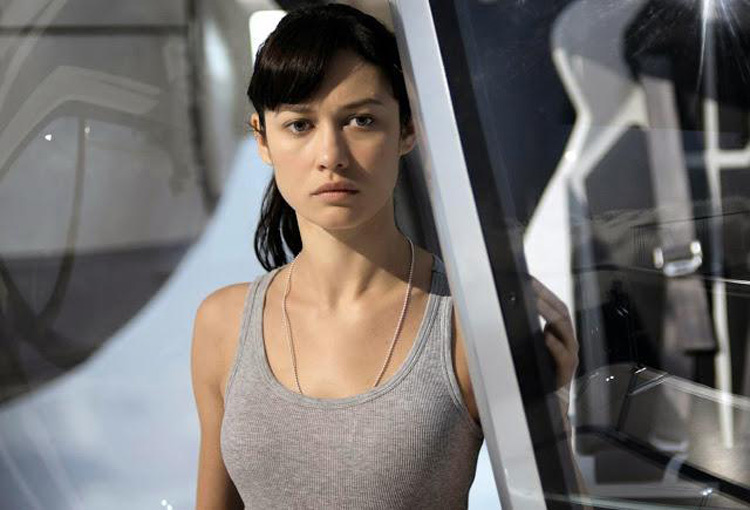 Rounding out the cast we have Nikolaj Coster-Waldau (Sykes), and the literal woman of Jack Harper’s dreams, portrayed by the lovely Olga Kurylenko. In his small, largely background role Nikolaj Coster-Waldau portrays a competent man with a prickly, stand-offish ego, who is slow to trust in others. Anyone who has seen him portray Game of Thrones character Jaime Lannister already knows that he can do this: but that’s largely the point. By casting to type the director is drawing upon strengths he already knows that the actors possess. As much as it pains me to say it, Olga Kurylenko’s character (Julia) and performance is probably the weakest of the film, especially considering how central she is the plot. I really like Olga, and enjoyed her in both the much-maligned Quantum of Solace and cult-classic Centurion. At any rate, in order for the story to work the audience simply has to like her character, and I do — so that part works. I just wish that her best performances in this movie weren’t the sections where she lacked dialogue. If you watch movies largely for the pretty pictures, this disc is automatically a great investment before considering anything else. I’ve tried to present screencaps here that show what true visual feast Oblivion is, and I’m sorry to say that I’ve largely failed. But this is a film that really needs to be seen in motion to be truly appreciated. Firstly, there is the ninth character in the film: the stunning volcanic landscape of Iceland where the majority of the action was filmed. Buzz Aldrin’s famous quote about the ‘magnificent desolation’ of the Moon seems to apply here; it truly is magnificent, a world of black sand, majestic mountains and craggy hills, ice and steam vents. The very landscape sells the post-apocalyptic long before we see the ruins of our great modern monuments littered about it. Secondly, there is the unified and appealing ‘Tet’ design shared by the majority of the gear shown in the film: imagine a world where everything was designed by Apple’s Jonathan Ive, and you already have the right picture in your head. This unified design is what made Joseph Kosinski’s freshman effort Tron Legacy work visually, and he’s cranked it up a notch here. 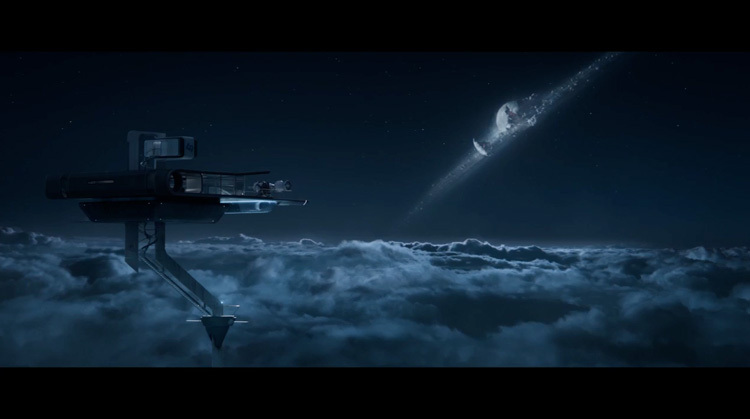 Watching the film I cannot help but want to fly about in the awesome (and strangely cute) Bubble Ship, and live in the wonderfully modernist Sky-Tower (assuming that Vika is part of the package deal…). The best part is that this design also ties into the story, as revealed in the second and third acts. Last – but certainly not least – I should mention how supremely competent the camera work is on this film, even during GCI-driven scenes. In an age of shaky-cam and blurry and confusing CGI special effects, camera work that supports the story seems largely a lost-art. But not here: frame by frame, scene by scene the camera is always our friend, leading us through the narrative and letting us see the action at a pace that our eyes can follow. It’s refreshing, and this movie along with Guillermo Del Toro’s Pacific Rim gives me hope that we will see this approach more in effects-driven films going forward. The video quality is exactly what you would expect from a modern film presented a major-release Blu-Ray disc: meaning that it’s stunning. The MPEG-4 AVC codec delivers a crisp, high-contrast picture that is pure video candy on your HD screen. From the very beginning of film, sound was part of the equation; even in the silent era, the piano player at the cinema was designated to provide exciting music to carry forward the action on screen. 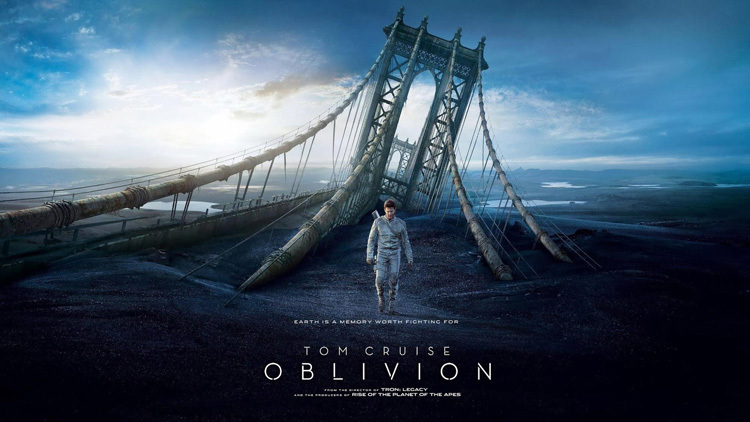 Oblivion doesn’t skimp on the sound-design; every footstep, every beep and buzz, every whoosh of an engine or report of a gunshot, every line of dialogue is crispy and competently presented to immerse us fully in the story. Whether it’s mission-control’s Sally reassuring Vika by video with her warm southern-soaked accent interrupted by the crackle of ever-present interference, or the foreboding mechanical hum of a drone, or the Star Trek sound (moderated by a jar-opening *thunk*) whenever the Sky Tower doors open, the sounds simply reinforce the narrative rather than drawing attention to themselves. Masterfully done. I cannot say enough good things about Anthony Gonzalez (of M83) & Joseph Trapanese’s soundtrack for this film: it’s absolutely in my top-ten favorite soundtracks of all time, and is excellent from the very first frame of the film and throughout the closing credits. Using a mix of classical orchestral instruments combined with electronic and modern sounds (two drummers! Two!) what should be a mess blends together to make a seamless and compelling whole. Tellingly, one of the special features on this disc is a music-only audio-track. We are back to watching a ‘silent’ movie; where the music and visuals alone work together to tell us the story. The DTS-HD Master Audio 7.1 main track will give your home-theatre system a good workout, and has the same excellent sound-separation I experienced watching this in the theater. Like the camera work, the sound is never muddy or confusing, and is nicely complimented by the dynamic range that only DTS can deliver. If you are anything like me, the first thing you do after watching a satisfying – or even less-than satisfying – movie on disc is watch the special features. I am happy to note that the special-features on the Oblivion BD don’t let us down here. 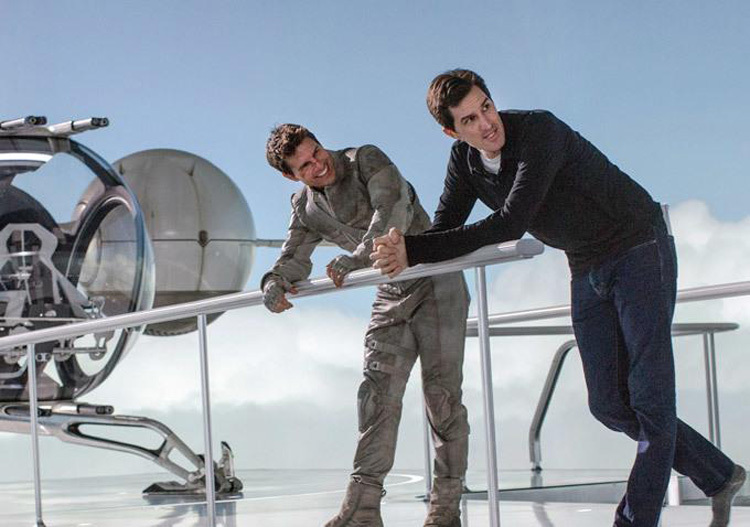 Audio Commentary: by director Joseph Kosinski and actor Tom Cruise. Promise of a New World: A five-part, 48 minute ‘Making Of’ video, presented in 1080p HD. Deleted Scenes: Just a few…and none really missed in the final film. The audio commentary is fun, but really just serviceable; Kosinski and Cruise are better at making movies than they are talking over them. The most fun to be had listening to this is Cruise geeking-out with sheer joy whenever a drone-pod disintegrates something on screen. The 48 minute ‘Making of’ mini-documentary, however, is great: taking us all the way from Kosinski’s unpublished (boo!) graphic-novel to the creation of the film itself. Highlights include the construction of the real-space Bubble Ship, the amazing rear-projection array used to provide lighting and backgrounds for the Sky Tower set, and Olga Kurylenko freaking out while on the roller-coaster-from-hell Bubble Ship rig. The deleted scenes are somewhat interesting, but it’s clear that they belong on the cutting-room floor. It’s good to see them just for historical reasons, though. I talked about the isolated M83 film score above, so there’s not much to say about that here. Anyhow, it’s great soundtrack and if you want something to play in the background while otherwise occupied on a lazy Sunday morning, you could choose far worse options. 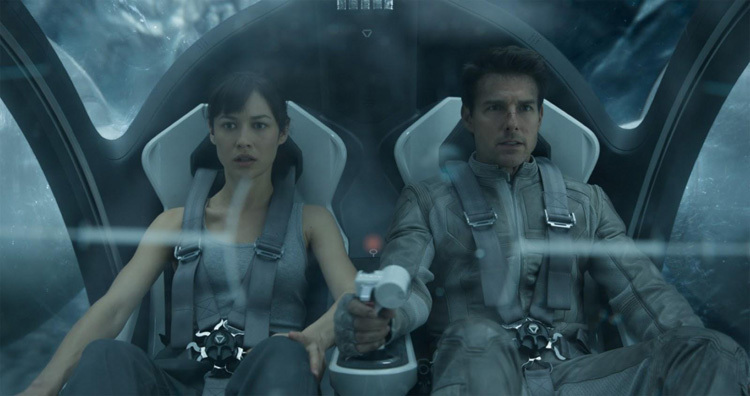 Although meant to evoke an earlier era of sci-fi, Oblivion is easily the most forward-looking science-fiction film of the last few years, at least among the big Hollywood productions. Not since 2001, Star Wars, Blade Runner or Fifth Element do I recall seeing a sci-fi film that presents a vision that comes across as 100% its own on the big screen. That being said, I cannot honestly say that this is ‘thinking man’s sci-fi’ along the same lines as Silent Running or2001; at the end of the day it manages to follow all of the tropes of an action sci-fi film all the way to its logical and inevitable conclusion. But it does all of this so well I’m willing to forgive all of this, since the entire ride is so much fun. As noted above I watch movies to be transported to a new place; and considering that this only Kosinski’s second film, I cannot wait to see where he might take me next. Be sure to check out this review and more exclusive content over at Comics Bulletin’s new sister site, Psycho Drive-in! The Wolf Among Us Livestream Diary "What if characters from fables came into our world?"